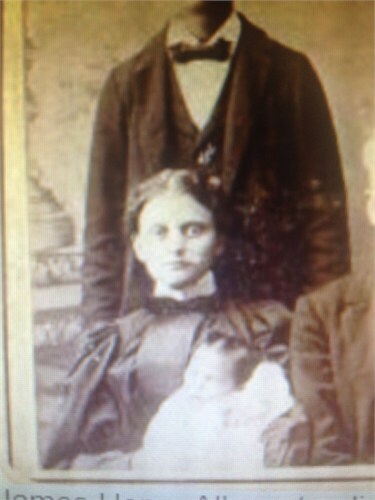 Lenton Roach married Virginia (Jin) White, daughter of Thomas Jefferson White and Martha Editha (Dithey) Brown. Lenton Roach was born on 4 May 1921. He died on 15 December 1990 at age 69. Bascom Beasley married Dytha Cleo White, daughter of Thomas Jefferson White and Martha Editha (Dithey) Brown. Bascom Beasley was born on 10 July 1913. He died on 19 February 1992 at age 78. Infant Child Tabb died on 26 May 1898. Infant Child Tabb was born on 26 May 1898. Infant Child Tabb was buried after 26 May 1898 at Houston Cemetery, Houston, Chickasaw County, Mississippi. Frances Tabb was born on 7 April 1900. She died on 23 May 1907 at age 7. She was buried after 23 May 1907 at Houston Cemetery, Houston, Chickasaw County, Mississippi. Betty A. Tabb was born on 15 May 1876 at Virginia. She died on 13 June 1876. Halsie D. Tabb was born in 1874 at Texas. Maymie Darley was born in 1911. She died in 1914. [S1077] Turner Cemetery Obituaries (Waverly Journal, January 1917) for Phebe (Buckles) Tabb. Mary Emily (Emma) Tabb married James Henry Allen, son of James Monroe Allen and Elenor Morgan Tabb. Mary Emily (Emma) Tabb was born on 29 November 1880 at Senora, Hardin County, Kentucky. She died on 8 April 1926 at age 45. She was buried after 8 April 1926 at Franklin, Illinois. Fannie Lee Miller married John Coleman Harrison, son of James Garland Harrison and Sarah "Sallie" Elizabeth Appleberry. Fannie Lee Miller was born in 1872. She died in 1950. Len Harrison was born on 16 October 1893 at Antioch, Arkansas. He died on 6 April 1969 at Little Rock, Arkansas, at age 75. Vela Harrison was born on 15 June 1897 at Antioch, Arkansas. She died on 2 February 1984 at Antioch, Arkansas, at age 86. Albert Harrison was born on 21 May 1900 at Antioch, Arkansas. He died on 30 March 1975 at Beebe, Arkansas, at age 74. Garland Harrison was born on 16 April 1902 at Antioch, Arkansas. He married Ida Mae Gaylor on 10 November 1928. Garland Harrison died on 17 August 1989 at Conway, Arkansas, at age 87. Ida Mae Gaylor was born on 20 March 1908 at Floyd, Arkansas. She married Garland Harrison, son of John Coleman Harrison and Fannie Lee Miller, on 10 November 1928. Ida Mae Gaylor died on 15 March 1996 at Conway, Arkansas, at age 87. Jeff Harrison was born on 14 December 1904 at Antioch, Arkansas. He died in October 1956 at Searcy, Arkansas, at age 51. Mary Harrison was born on 25 January 1908 at Antioch, Arkansas. She died in April 1990 at Antioch, Arkansas, at age 82. Pauline Harrison was born on 26 July 1910 at Antioch, Arkansas. She died on 24 September 1999 at Antioch, Arkansas, at age 89. Roy Harrison was born on 24 May 1914 at Antioch, Arkansas. He died in February 1982 at Antioch, Arkansas, at age 67.